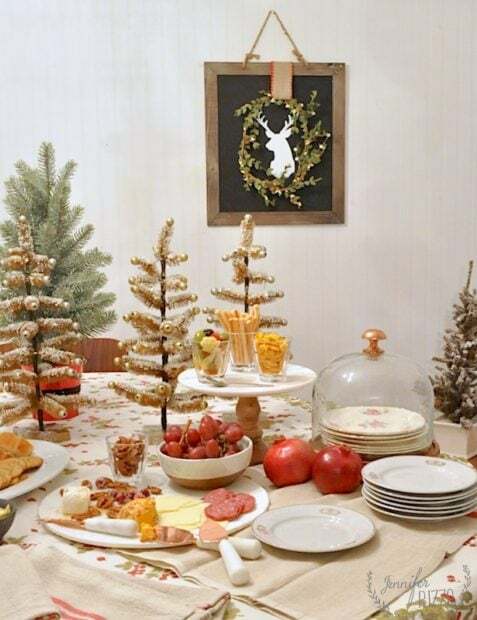 I am joining the Seasons of Home group again, and Caravan to share a little of my Christmas dining area table set for a mini holiday party . As many of you know,I’m in a split level home, and I don’t have a separate dining room, so we dine in the space right off of the kitchen. One Christmas, we did have our table right in the kitchen, and while it worked for a while, but I didn’t like that it was too tight when we wanted to extend it out for extra seating. With the table in the actual dining area, we can open it up to the entire length and seat almost 12 in our little space! 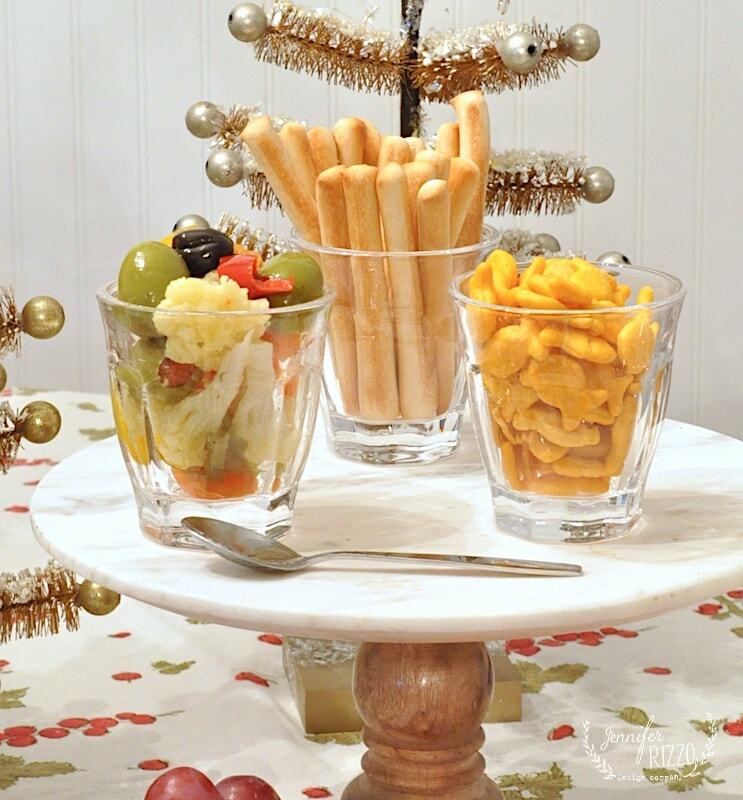 Sometimes, when we have people over, instead of having a full sit down, I like to be able to do a table setting with appetizers and nibbles for a more casual feel, for a mini holiday party. Then, I can enjoy the party, and time with my guests more instead of worrying about serving food. I normally start by putting down a pretty tablecloth. Since our table is where everyone does everything, it takes a beating. The kids were making slime on it last week, and two weeks ago, I had 6 teenagers painting canvases on it. A nice tablecloth is a must! 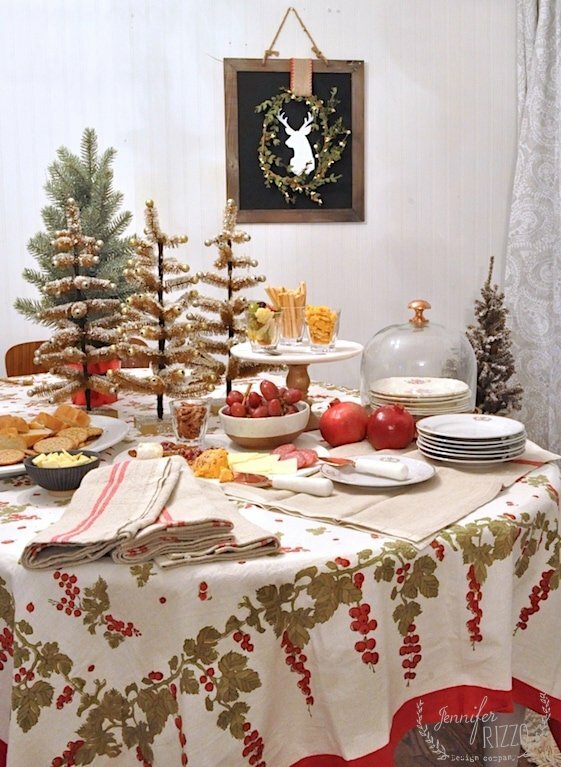 I love this beautiful tablecloth form Caravan(From their sister site Couleur Nature), because even though it has holiday-ish colors, I can use it all year. I added a few trees from our retail store. 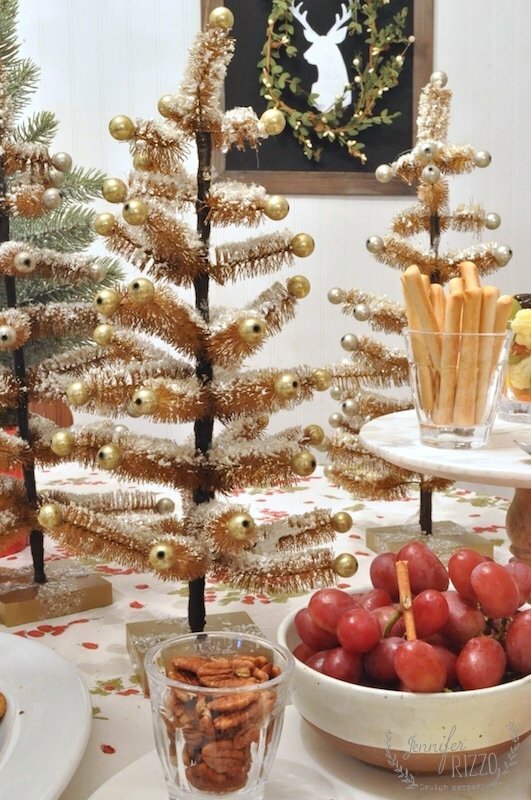 I love these cute bottle-brush trees, they have just the right amount of quirk! I had to grab them after we decorated our shop in a Camp Christmas theme before they were gone! One thing I really like to do with all of my cake plates, cutting boards, and serving trays when I am setting up is vary the height. This helps me fit a bit more on the table. 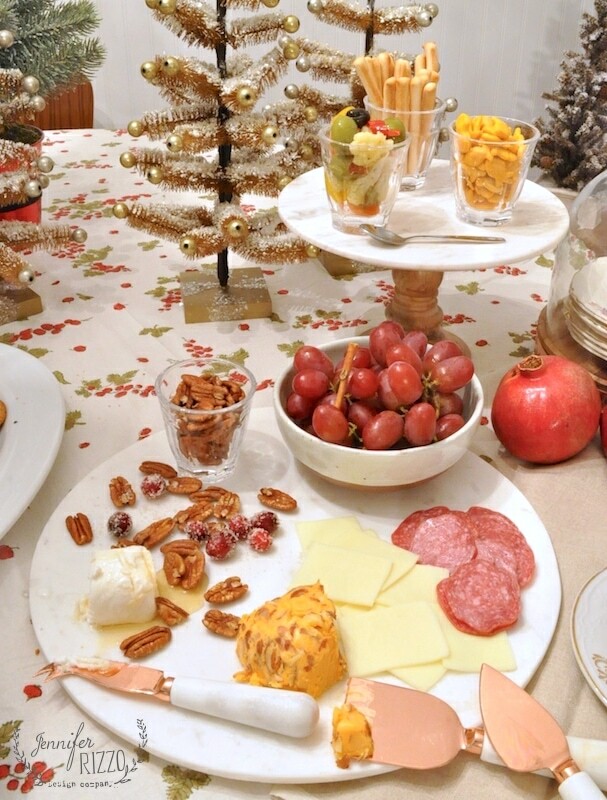 This beautiful marble round tray,and cheese knives with marble handles from Caravan are a beautiful addition. 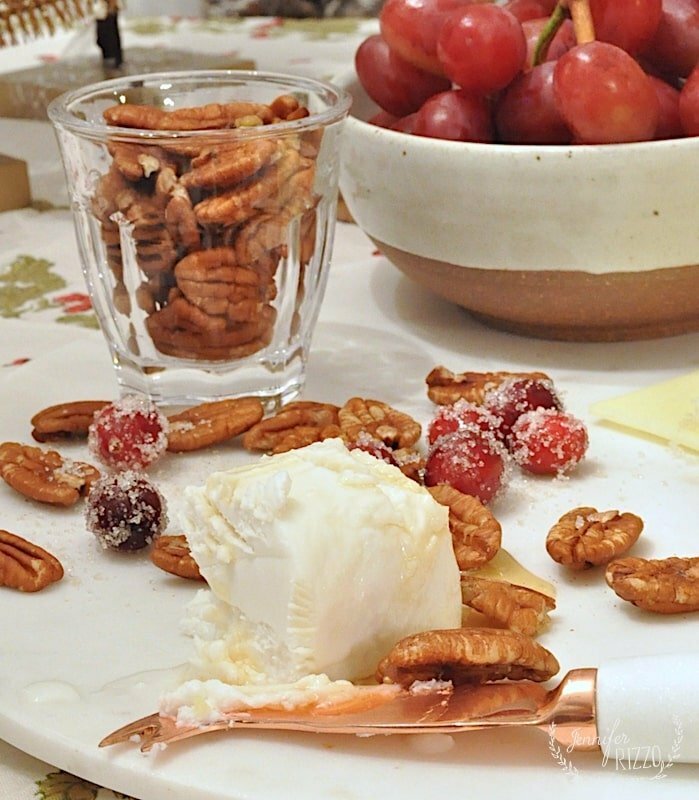 For an easy nibble,I love taking a plain goat cheese and drizzling it with local honey, and serving it with toasted pecans. It makes such a yummy and easy combo. I also love to add some fresh fruit such as grapes. I sugared some cranberries just to add some color.Little tried one and then spit it out. They might be just a tad bit sour. I also like to use other non-serving items to hold small bites. These beautiful, small glasses are perfect for nuts, sweets, or little finger bits like I have here. I added some crackers for the kids too. 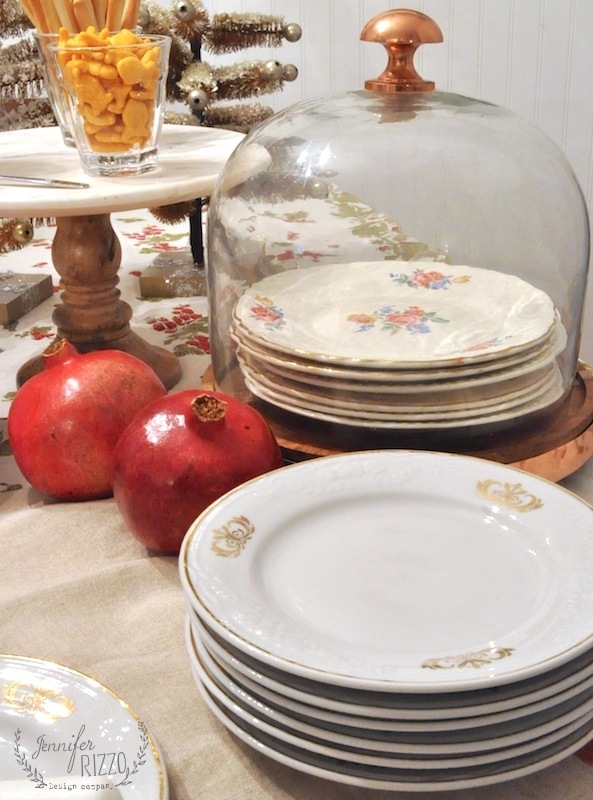 I also like to serve on vintage food-safe dessert and salad plates I’ve collected over time. They are so pretty and unique. I don’t pay more than $1.99 for each one, so if one gets damaged or dropped, I’m not heartbroken over it. And anything served on a marble cheese board looks amazing! 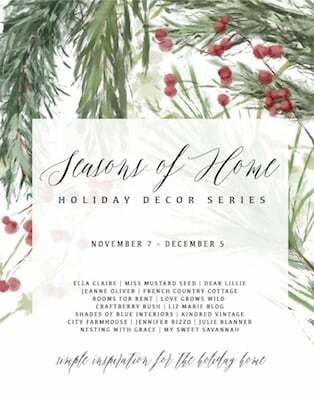 I hope you enjoyed my little table tour for a mini-holiday party, make sure to visit the other bloggers on the Seasons of Home holiday tour! If you’re looking for more holiday inspiration, you can also check out my book ! From Caravan/Couleur Nature: Tablecloth,Round marble cheese tray,marble and copper cheese knives,terra cotta bowl, french linen napkins,small drinking glasses. So sweet Jennifer! Love it!